2017 Rinker EX 320 More Than Just Good Looks! This boat can perform! Whether its out for the day with guests in the award winning cockpit, or away for the weekend with family in her luxuriously appointed cabin, your entire crew will be excited for their next adventure aboard your new Rinker EX 320!! 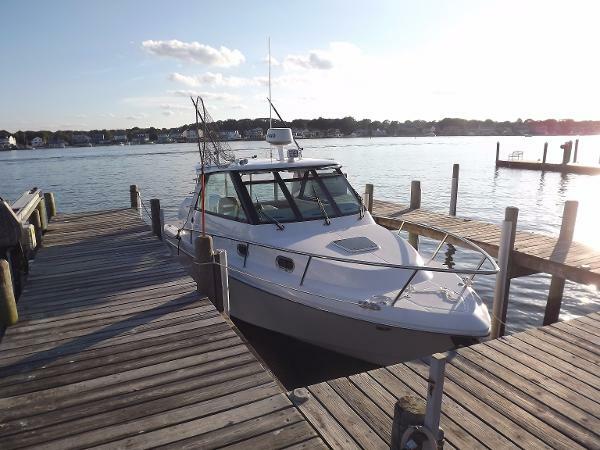 This beauty is equipped with a pair of Mercruiser 6.2 MPI Bravo 3s, Hardtop, Air/Heat, Cockpit Grill and Fridge, Bow Sunpad, Windlass Anchor, and a Whole Lot More!! Designed with comfort, function and performance in mind, the EX320 has the space to comfortably sleep five and the power to make it to your destination in good time. With plenty of space on deck and in-cabin, even the tallest of your guests will feel at home in this feature-packed cruiser. Only $833.00 per Month! With approved Credit. 20% Down. 3.99% APR/240 months. 2017 Everglades 320 EX 320EX: Fishing Comfort and Style Everglades' 320EX was designed to be your weekend getaway on the water. With 700 hp and a 290-gallon fuel tank, you can go farther faster, and never leave the comforts of home.The bridge deck is enclosed on three sides and comes with a canvas back for full enclosure. Full-height windows offer increased visibility and unobstructed views; half side windows are optional. For complete climate control, the helm has a dedicated 110 V AC system, and 3 electrically actuated vents in the windshield provide natural ventilation.The cockpit features a fully adjustable custom captain's chair, lighted grab rail, under gunwale storage, and full size steps to port and starboard walkways. Creature comforts aside, this boat can fish. She is well-equipped with 21 rod holders, an 81-gallon fish box and 43-gallon livewell, plus a dedicated bait-rigging station complete with cutting board, sink, and tackle storage.The luxuriously appointed cabin features 6'4" of headroom, 2 full berths, a 19" flat screen TV, DVD player, galley, and head with shower. The galley includes a microwave and electric cook top, and a teak table that converts to a padded bunk.If you're looking for a sleek and nimble cabin cruiser that doesn't compromise on fishability, Everglades' 320EX is your boat. Financing Available! 2015 Everglades 320EX 2015 Everglades 320EX w/ twin Yamaha 350's (only 69 hours). White hull sides with custom painted white Yamaha motors. Full Simrad Electronics package including: 2 NSS 12' displays, Simrad Virtual Auto Pilot, B60 Airmar transducer, Simrad 4G dome radar. Factory installed bow thruster, Westerbeke Genset, Two A/C units with reverse cycle heat- one for the helm and one for the cabin. Super clean boat with low hours. Boat is located in Brielle,NJ for the summer. Call to schedule an appointment. 2010 Everglades Boats 320EX, 2010 Everglades 320EX. powered by twin Yamaha F350 V8's with only 250 hrs. Stored inside and well maintained this is a very well equipped Express. Twin Simrad NSE 12's at the helm, Simrad radar, autopilot and hydrostatic release liferaft. 16k BTU AC at the helm and 8K BTU in the cabin too, all powered by a westerbeake genset.FACTORY MOTOR WARRANTY IN EFFECT THRU JUNE 2017! 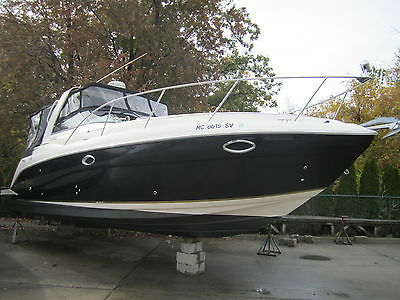 PROJECT BOAT: 2005 Rinker 320 Fiesta Vee-NO MOTORS, Freshwater Boat Since New! 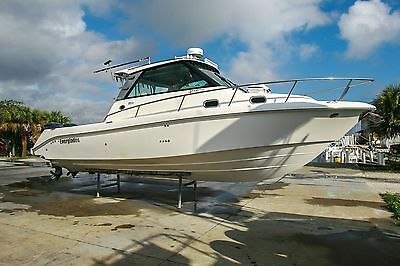 PROJECT BOAT 2005 Rinker 320 Fiesta Vee 32’ Express Cruiser Hull I.D.# RNK78786C505 This is an auction for a PROJECT BOAT. NO ENGINES. NEEDS ENGINES. Got a pair of small block Chevys lying around? Then this boat’s for you! Easy project for the right person… Rig it and go boating, or flip it and make a nice profit… This is a local, freshwater boat that sustained engine room damage due to a small engine room fire. Prior to this, the boat was in well above average condition. The engine room has been cleaned and any fiberglass work need has been completed. The boat was previously powered by a pair of Mercruiser 350 MAG/MPI Engines. Boat will need Engines and rigging. Needs wiring and shift/throttle cables. THIS SALE WILL INCLUDE THE BRAVO 3 OUTDRIVES AND THE S.S. PROPELLERS THAT CAME WITH THE BOAT. Props have been re-conditioned and drives are in good, clean, freshwater condition. (Pictures show the drives on pallet… they are dusty from storage.) Structurally, she is good condition, with no signs of damage or abuse. There are no major scratches, nor are there any repairs to the hull or decks. The decks are solid, and the bottom has anti-fouling paint. The canvas consists of BRAND NEW CAMPER CANVAS and original cockpit cover in good condition. The upholstery throughout is in very good condition. The cockpit and cabin carpet is dirty, and could use professional steam cleaning. VALUE: Many of these boats sell for $60,000.00 to $75,000.00 on the internet and open market. This boat will sell for much less… Someone is going to get a GREAT DEAL!!! 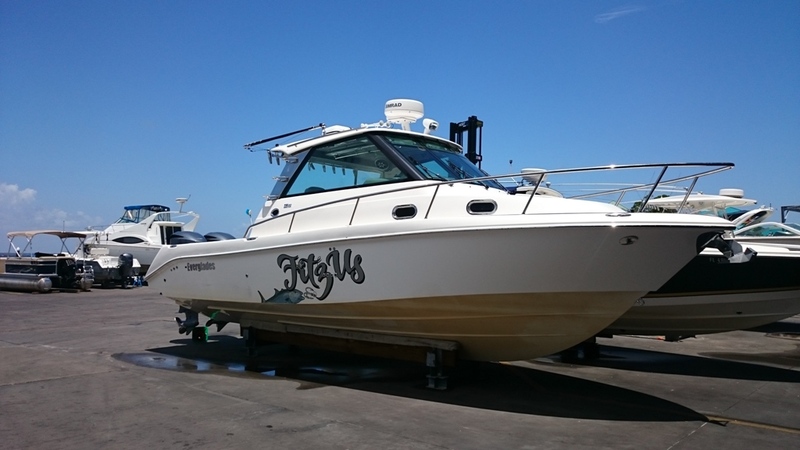 ALL BUYERS ARE WELCOME TO SEND THEIR AGENTS OR SURVEYORS TO INSPECT THIS VESSEL , BUT PLEASE DO SO BEFORE COMMITTING TO PURCHASE This boat and title are free of all liens and encumbrances. 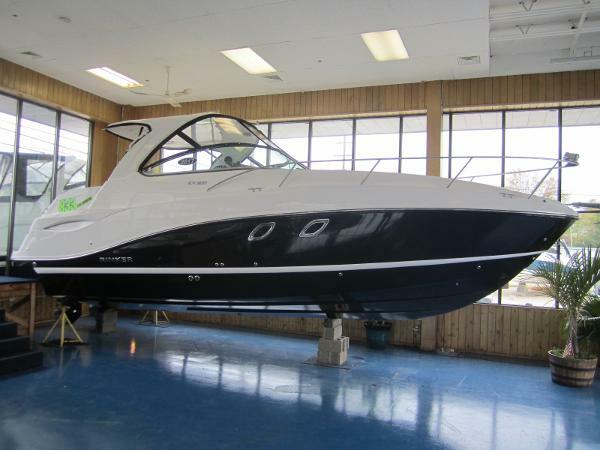 This boat is located at our facility in Harrison Township, Michigan, and must be sold. FEATURES AND EQUIPMENT: Sleeping for 6 V-berthMid-Cabin berthConvertible SeteePrivate enclosed head w/showerGalley sink2 burner electric cooktopAC/DC RefrigeratorMicrowave ovenBuilt in coffee makerTV/DVD playerHot water heaterExtended Swim platformSwim ladder30 amp/120V Shore powerShore water inletMarine Air/HeatWindlass AnchorRaymarine C70 Radar/GPS/PlotterVHF RadioFull instrumentation Trim tabsCompass Navigation lightsHorns LOA: 34’ 8” BEAM: 11’4” Engines: NONE Weight: 12,360 LBS Fuel: (GAS): 165 Gallons Water: 35 Gallons Waste: 45 Gallons Trailer: NONE. NO TRAILER INCLUDED IN SALE Yard Storage Fee: Paid until November 30th, 2015. After this date there will be a $10/day storage charge. Please Note: The Marina charges $10/foot to load boats onto trailers or trucks. This fee can be paid at time of pickup. We do not ship or haul boats. Contact a marine hauler or company such as U-Ship for a shipping quote. We can also provide contact info for local companies and international shippers. Location of vessel: (Harrison Township, Michigan 48045) Send checks to: Hossack Marine Sales 36290 Jefferson Ave. Harrison Township, MI 48045 If you have any questions please e-mail or call: JOHN: 248-765-5610 Make all checks payable to Hossack Marine Sales A 10% NON-REFUNDABLE hold deposit is required within 48 hours after auction closes. Please use FedEx overnight or an equivalent overnight shipper. PayPal may also be used for deposit only. If the deposit is not posted the next day, the boat will be sold to the next person in line at our discretion. Final amount due no later than 10 days after auction closes. Wire transfer or cash for final payment. Vessel is free and clear of all liens and encumbrances. Vessel sold as is-where is, no warranty. All Michigan buyers must pay 6% Michigan Sales tax and all registration and transfer fees unless registered as Michigan watercraft dealer. All buyers must abide by the laws of the State of Michigan in regards to sales and use taxes. This vessel is for sale locally. We reserve the right to end this auction early. The Company offers the details of this vessel in good faith but cannot guarantee or warrant the accuracy of this information nor warrant the condition of the vessel. A buyer should instruct his agents, or his surveyors, to investigate such details as the buyer desires validated. This vessel is offered subject to prior sale, price change, or withdrawal without notice. 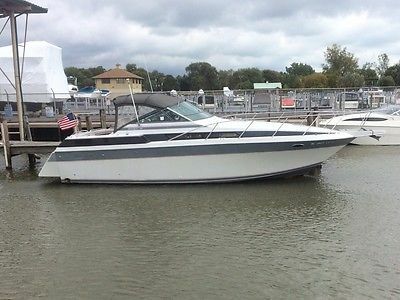 2008 Sea Ray 250 Select EX 2008 SEA RAY 250 SLX WITH 6.2L 320 HP BR 3 MERCRUISER WITH 270 HOURS! 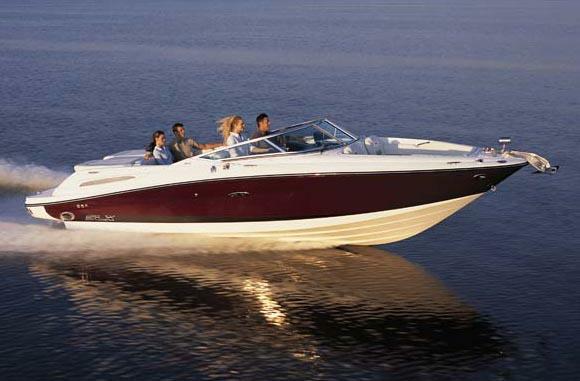 THIS BOAT IS READY FOR YOUR FAMILY AND FRIENDS TO HAVE A BLAST ON THE WATER! UPGRADES:TWO PACKAGE W/ SMART CRAFTPEWTER HULLDOCKING LIGHTSSNAP IN CARPET LINERSTOWER WITH BIMINI WITH TANDEM TRAILERINSIDE HEATED STORAGE! COME AND SEE TODAY! **NOT ACTUAL PHOTOS** The sleek and sporty 250 Select EX from Sea Ray is the perfect setting for a first-rate ski party. 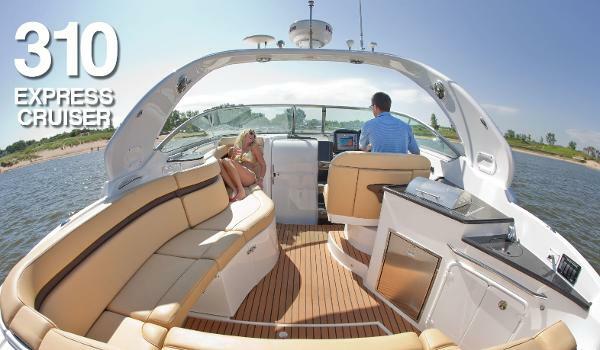 With ample comfortable seating, everything in place for effortless entertaining and plenty of power, the 250 Select EX is the a great offering in the premium luxury series of boats from Sea Ray.